ระบุวันที่และเลือกโรงแรมและที่พักอื่น ๆ จาก 302 แห่ง! Diver’s Paradise Bonaire it is located 2 km from a wide selection of shops, restaurants and supermarkets; and 3 km north of Kralendijk town centre. Bellafonte Luxury Oceanfront Hotel offers easy access to the bay’s coral reef. El personal fantastico, muy buena atencion y colaboracion en todo momento, nos ayudaron en todo lo que necesitamos, especialmente la Srta. Ana de recepcion por su simpatia y amabilidad. Habitacion muy confortable y espaciosa. 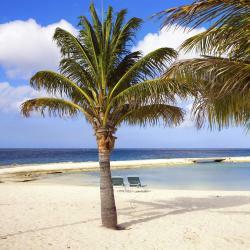 Situated in Kralendijk, Boutique hotel Islander Bonaire offers air-conditioned rooms with free WiFi. Among the various facilities of this property are a terrace and a bar. Situated in downtown Kralendiik, this boutique hotel is just 200 metres from the shops and restaurants of Kaya Grandi Street. Central Hotel Bonaire offers air-conditioned rooms with private balconies.... el hotel esta en el centro. esta lejos de las playas, necesitas alquilar un carro para llegar a las playas aun las mas cercanas. el hotel estaba limpio y el servicio de habitación es bueno. Aqua Viva Suites is located in Kralendijk and features an outdoor swimming pool and barbecue facilities. With free WiFi, this 3-star hotel offers free shuttle service. Located in Kralendijk, Tropical Inn features an outdoor swimming pool, garden and terrace. This 3-star hotel has air-conditioned rooms with a private bathroom. Offering free WiFi, a sun terrace with a swimming pool, garden and shared lounge, Resort Bonaire is located in Kralendijk. Very comfortable, zen in the setting and decoration. For the most part, very well appointed. Espresso machine was a plus (once we figured out how it worked! see below for pitfalls), along the dishwasher and a generous quantity of dishes, glasses and silverware. Very well ventilated for the penthouse units. Fantastic balcony! We had reserved two 3-bedrooms penthouses and one was not yet ready, so we were given two 2-bedrooms apartments (one of them a penthouse) all units in the same building. This was great! They did that at no extra costs to us. Also, they programmed the keys so all keys could open all apartments, which we liked so we could go from one kitchen into another one as we were sharing food. Availability of an elevator was a plus: for our elderly patriarch, but also to bring in and out our luggage. Great location for our needs: in between Kralendijk (with restaurants and grocery stores) and Lac Bay (for windsurfing). One unit was not rented the days of our departure and they let us do a late check out at no costs - this was great, as we wanted to shower and grab a bite before leaving. Staff very friendly! Captain Don's Habitat provides air-conditioned accommodation in Kralendijk. With an outdoor swimming pool, the property also has barbecue facilities, as well as a garden. Boasting a sun terrace with a swimming pool, as well as a garden, The Cottage Club Hotel is set in Windwardside. Free WiFi is available. Offering an outdoor pool, Sonrisa Boutique Hotel is within a 10-minute walk of Kralendijk’s beaches and colourful colonial centre. Pequeno almoço delicioso. Manager super prestável. 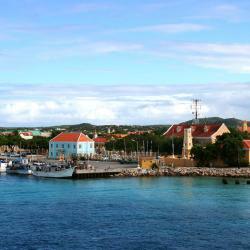 This colorful Bonaire resort is just a 1-minute walk from the Caribbean Sea. 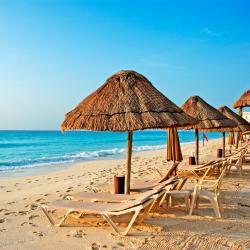 It features a bar, a restaurant that serves breakfast, and on-site scuba diving facilities. Featuring free WiFi and a year-round outdoor pool, El Encanto Boutique Hotel offers accommodation in Kralendijk. Guests can enjoy the on-site restaurant. 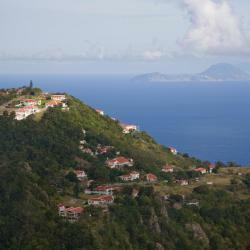 Coral Paradise Resort in Kralendijk features an outdoor swimming pool and barbecue facilities. This 4-star hotel offers a concierge service and ticket service. Offering an outdoor swimming pool, garden and a sun terrace, Golden Era Hotel is located in Oranjestad, 400 metres from St. Eustatius Museum and 350 metres from Fort Oranje. 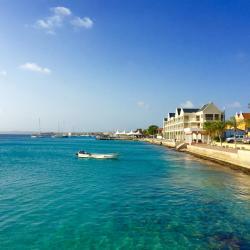 Featuring a natural pool, free WiFi and air conditioning, Bridanda Apartments Bonaire is located in Kralendijk. Free private parking is available on site. All units include a seating and dining area. Pretty amazing Apartment complex in walking distance to very good restaurants and beaches. The Owners were very kindly and gave very good recommendation about the island. If your are looking for a individual accomodation you will find it at Bridanda. This modern-style property located 2.3 km from Flamingo Airport has a swimming pool, free Wi-Fi access and an outdoor patio. Free parking is also available. Facing the beachfront in Hato, The Laughing Seahorse features an outdoor swimming pool and barbecue facilities. Featuring luggage storage space, this property also provides guests with a sun terrace.